Mint Julep - A recipe from Savor California, the online showcase for extraordinary gourmet foods and beverages from California. Recipe by Eric Felton, Wall Street Journal, May, 2007. 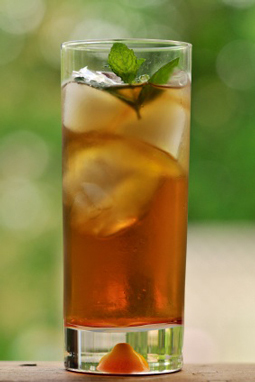 Pour Mint Infused Syrup into a 10- to 14-ounce chilled highball or silver julep cup. Add mint leaves and fill with crushed ice. Muddle and agitate with mixing spoon until outside of glass or cup is frosty.